Matthew, the youngest of three children of Rick Warren and his wife Kay, killed himself Friday, the evangelical pastor said in the letter which described his son "an incredibly kind, gentle and compassionate young man whose sweet spirit was encouragement and comfort to many." “No words can express the anguished grief we feel right now,” Warren wrote. “He had a brilliant intellect and a gift for sensing who was most in pain or most uncomfortable in a room. He’d then make a bee-line to that person to engage and encourage them." He continued: "Kay and I often marveled at his courage to keep moving in spite of relentless pain. I'll never forget how, many years ago, after another approach had failed to give relief, Matthew said, 'Dad, I know I'm going to heaven. Why can't I just die and end this pain?' but he kept going for another decade." "The Biblical answer is yes... there is no sin you can commit that will cause you to not go to heaven if you've truly had an experience with Jesus Christ... That's not the end of the answer, though. ... I do know that some people commit suicide out of mental illness but someone who commits suicide not out of mental illness ... you'll go to heaven but you'll lose all kind of rewards." While it is horrible that the younger Warren took his own life, does his father the evangelical pastor believe his son will go to heaven and receive the full benefits of going or will he make an exception for his son? Are all suicides made different in the eyes of his lord? Were his comments born from his dealings with his own son? How will Warren reconcile his son's death with his own faith (and what he has preached to others)? "God never wastes a hurt." "Since God intends to make you like Jesus, he will take you through the same experiences Jesus went through. That includes loneliness, temptation, stress, criticism, rejection, and many other problems." "There is no growth without change, no change without fear or loss and no loss without pain." "Why is this happening to me? Why am I having such a difficult time? One answer is that life is supposed to be difficult! It's what enables us to grow. Remember, earth is not heaven!" It is understandable that people will view this post in poor taste. It is also understandable that people will fail to question not only their faith but the faith of their leaders in times like these. 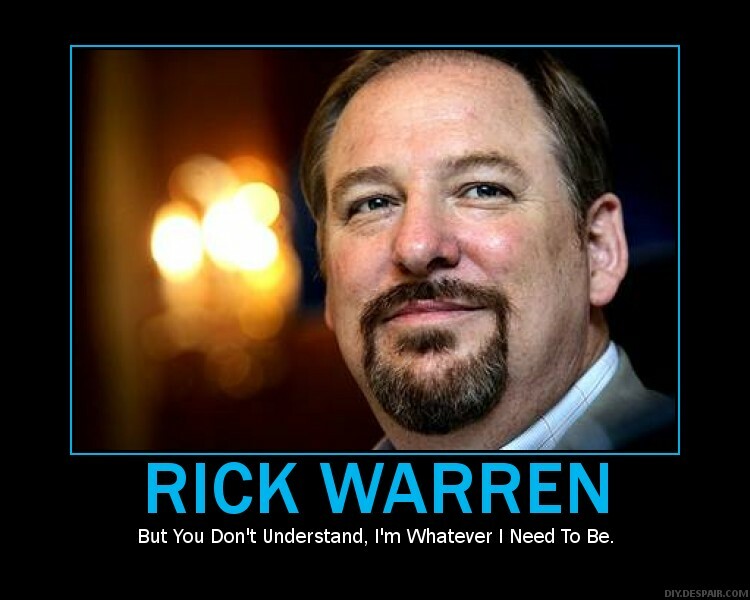 It is for this reason that these quotes by Rick Warren are posted in a story regarding the suicide of his son. After all, Warren should be comforted by his own words - that his son will enter heaven and be one with God because he took his life while suffering a mental illness. Why do I think there is more to this than "mental illness"? We really have no way to judge because we didn't know Matthew, except from his father, a public figure with a reputation to uphold. I don't necessarily think it is more than a "mental illness." I have seen all the theories, from Matthew long suffering from depression to being a closeted homosexual who was tortured by his father's public persona. All I point out was that his father had made some statements regarding a situation (suicide) that seems to conflict with other things he has said, essentially questioning Rick Warren's comments and blatant hypocrisy.